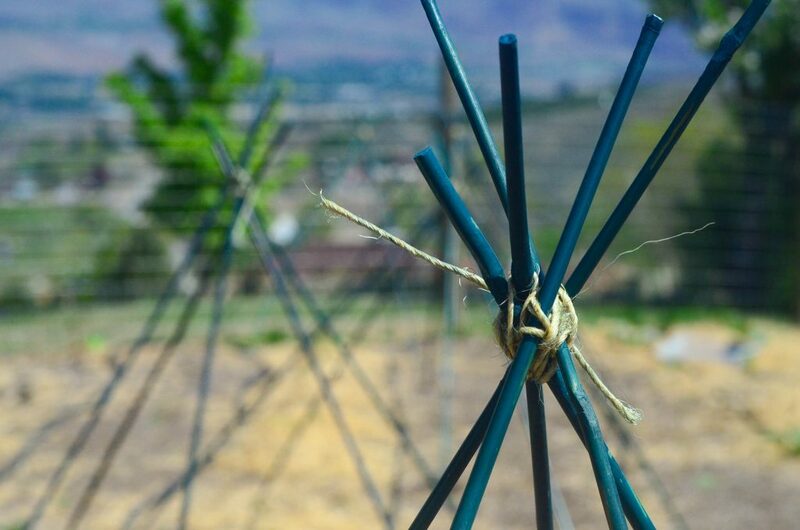 How To Build A Tomato Cage For Under $4. I’m a big, crazy contradiction. Yesterday, I bought a $19 orchid plant for my bedroom because it was beautiful and made me happy. 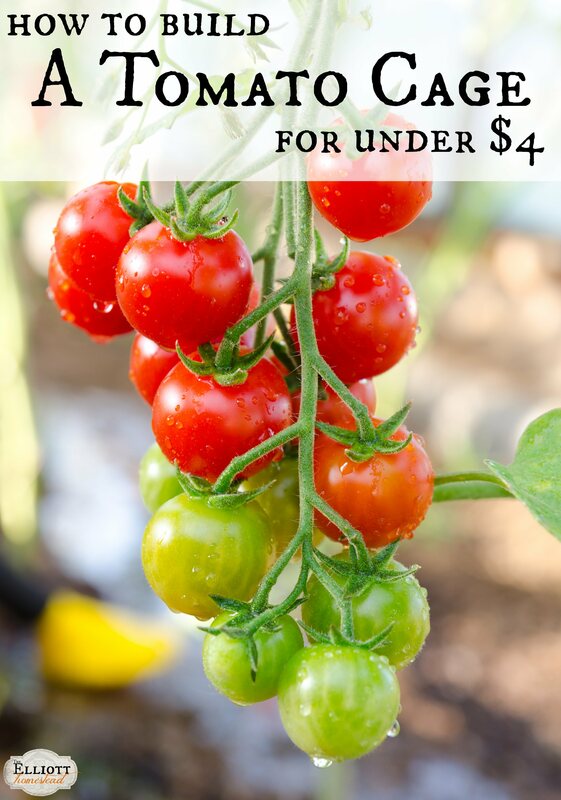 And then I go and do a post on how to build a tomato cage for under $4 because I’m too much of a tightwad to splurge on the metal cages. I guess we all choose to splurge where we see fit in our budgets and tighten the belt where we’d rather not blow a lot of our hard earned money. Truthfully, tomato trellises weren’t too high on my priority list. Mainly because they’re all pretty bad, anyway. Even the ready made kind are known to break, sag, bend, and flop over. So this year, I figured I’d cut my losses and try and build some myself. Oh DIY. How you get the better of my sometimes. I am happy to report that we’re about a month into these cheap homemade tomato cages and they seem to be doing the job well. Even though the plants aren’t yet heavy with fruit, the structures are still standing and as strong as they were when I made them. And with the horrible wind we get up on the hill, that’s a good sign. And did I mention they were cheap? Okay good. Just didn’t want you to miss that point. 1. 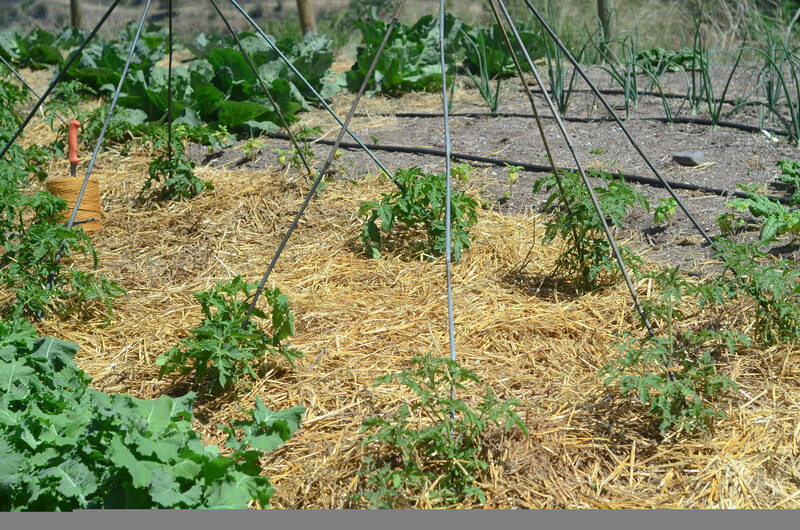 Locate the best sunny location in your garden for the tomato plants. Roughly draw a circle 4 feet in diameter in the soil. 2. Select 5 bamboo stakes. 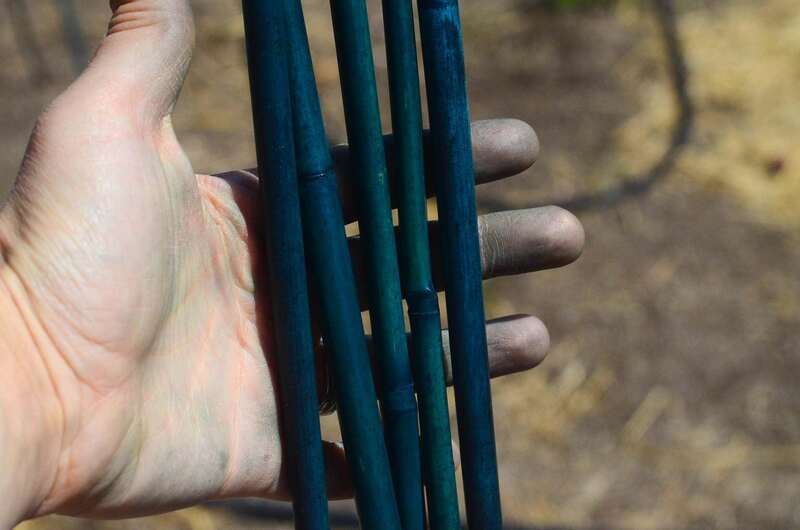 Drive each stake into the soil at least 8″ at a slight angle so that the bamboo stakes point inward towards the middle of the circle just slightly. 3. Drive the remaining stakes into the drawn circle, evenly spaced. The points should all be facing inwards – resembling a teepee of sorts. 4. Use a large piece of twine to bind the bamboo stakes together in the middle. This is where the support of the structure is, so make sure to take time and do it well – wrapping each stake carefully and tightly. I like to start with two and wrap them together. Then I had the third and warp that in. Then the fourth, etc. Adding one at a time can help to ensure they all get bound tightly. I’d like to say there’s a perfect method for this, but frankly I’m too lazy for that, so my cages quickly became a “wrap-it-until-it-feels-tight” kinda thing. I just kept going and going and going until it felt right to end it with a quick knot or two. Oh ya, baby. See that incredible engineering? 5. Plant a tomato plant at the bottom of each bamboo stake. 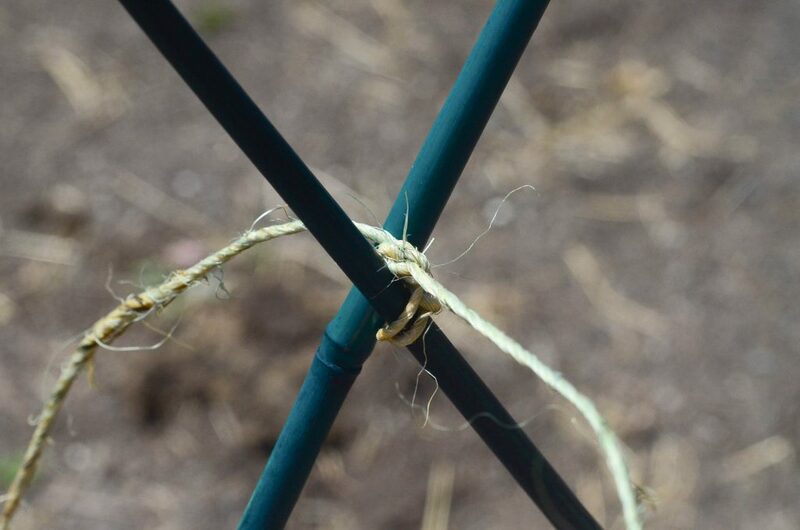 As the tomato plant grows, take time to prune off suckers and bind the main stem to the bamboo stake with small pieces of twine. The bamboo will help to create a support for the plant as it grows. This year we are growing all heirloom varieties – Tommy Toe, Italian Heirloom, Yellow Pear, Brandywine, and Gold Metal. It’s the first year that I’ve completely started every single tomato plant from seed so this gardener has her fingers and toes crossed that they yield high and produce delicious fruit! 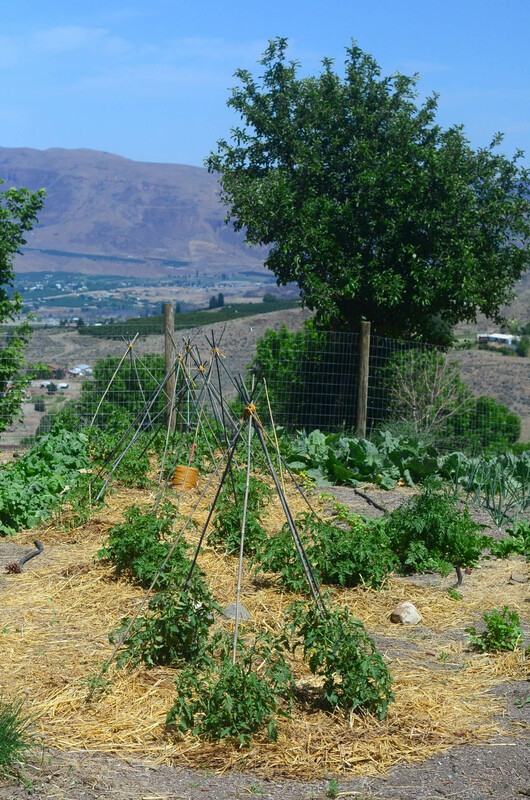 I feel these tomato cages are a great reflection of life on our homestead. We’re learning to adapt and overcome in the face of adversity – learning how to problem solve, work within in our budget, and keep within our means. Purchasing fifty tomato cages for our plants was out of the question financially. Luckily, these bamboo stakes sell for just a few bucks a package (ours came in packages of six) and the twine was just a few cents worth. I estimate that each tomato cage (which will support five tomato plants) costs us about $4, with the local garden supply price that we paid for the bamboo. Considering a metal cage sells for about $15 and will only support one plant, I consider that a huge financial savings! 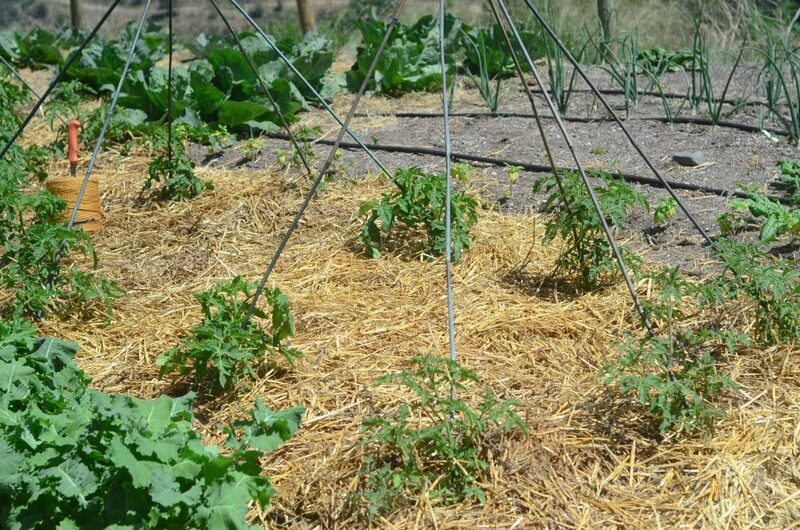 The bonus is that the bamboo stakes can be easily moved, easily replaced, and easily upgraded to a heftier size of bamboo stake if your tomato plants demand a stronger trellis. I sure do miss that giant patch of bamboo we had in our backyard when we lived in Alabama. Girlfriend could sure use that free resource in the garden right about now! 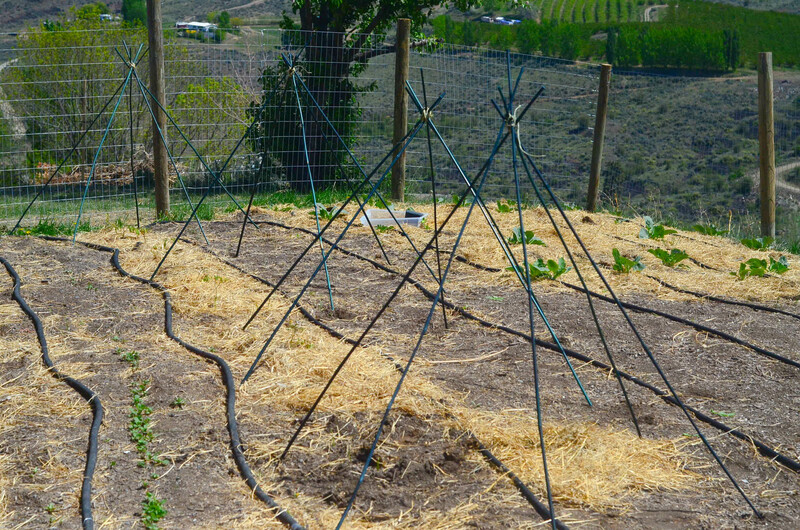 Green beans, peas, and cucumbers are all getting this same trellis treatment! Here’s to a year of great tomato harvests – from my garden to yours! This is Great! My husband created something very similar to this for our pole beans! Instead of bamboo he just used old branches from my mothers brush pile! Yay recycling:) This year is our very first garden and it’s so exciting to see everything popping up! Great idea! We have NO trees on our property. I wish we did! All I can say is your view is gorgeous! Watched your youtube video the other day…when you head out to go milking…it was just breathtaking with that view and the early morning sun! These are cute! I made my own bamboo trellises a few years ago trying to save money. Most of them were not usable the following year. It was because the smaller diameter ones sort of composted in the ground. The very largest seemed ok, but the following year I had a hard time getting them in the dirt before they would split on me. I don’t think anything made it a third year. I looked into getting more substantial bamboo poles that would last longer and decided for the cost I should just get the metal ones. I loved this post, I do the exact same thing when it comes to buying flowers! I can totally justify buying a beautiful hanging pot of flowers for $20 at the greenhouse but then balk at having to fork out a couple bucks for something else we need on the homestead 🙂 We built trellis like this for our pole beans, I never thought about doing it for tomatoes so might have to try this! Pretty well! What a heck of a tomato year it was! Where are your late season pics? I need to see how it worked!